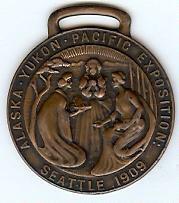 On June 1, 1909 in Seattle, on what is now the University of Washington campus, the Alaska Yukon Pacific Exposition opened. It operated until October 16 and was a resounding success with thousands of people visiting. Two original fair buildings were recently still in use by the university. Also still there is the beautiful fountain which was originally called "Geyser Basin." Standing looking toward the fountain one can see the majestic beauty of Mt. Rainier rising above and behind the geyser. 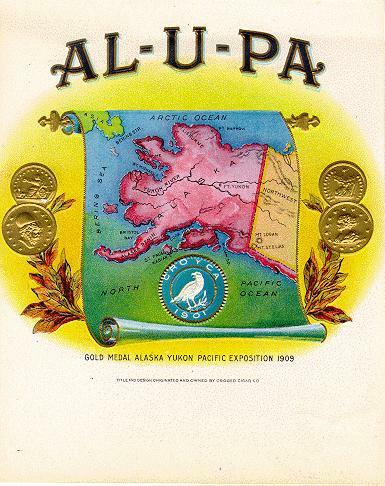 Cigar Box Label from the Alaska Yukon Pacific Exposition. 5 3/8 inches by 6 1/2 inches. $9.99 postpaid. 1 3/4 inch x 1 1/2 inch watch fob from the AYPE. This is one of the official souvenirs of the fair. $25.00 postpaid. 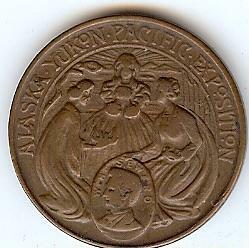 13/16 inch wide little brass pin from the AYPE. An ad in the 1909 book "Seattle and the Pacific Northwest" calls this pin the "most attractive souvenir of the fair." $7.00 postpaid. 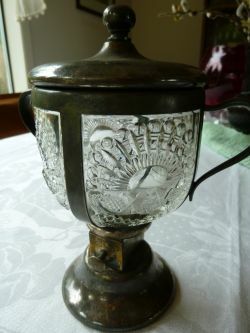 Very interesting and unusual AYPE sugar dispenser. You hold the dispenser over your coffee cup and press the button on the base and a measured amount (about 1 teaspoon I think) of sugar is dispensed. The whole thing is 7 3/4 inches tall and is the "Sunburst" pressed glass design. Metal parts are plated. I have not tried to polish it. There is considerable plating loss. $95.00 postpaid. 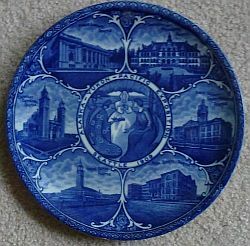 9 3/4 inch plate with logo in center and six scenes of buildings in Seattle. $49.00 postpaid. For additional items and information, send me an email.